The structured identification, measurement and assessment of a appropriate Sustainability Indicators, SI's, is what Model IB delivers to illustrate actual building performance. What are Sustainability Indicators (SI's)? A popular approach to gauging sustainable development performance is the creation of sustainability indicators (SI's) - Bell & Morse, Meadows. Sustainability indicators (SI's) are individual nuggets of data that define physical or social knowledge and present it in a measurable format. There are many well known theories, widely adopted by the sustainable development community, that support SI identification and creation and these are adopted into the Model IB Sustainability Framework. The Model IB Sustainability framework adopts philosopher Herman Dooyeweerd's 'Aspects Of Reality' to serve as a structure by which a building can be evaluated as a system. 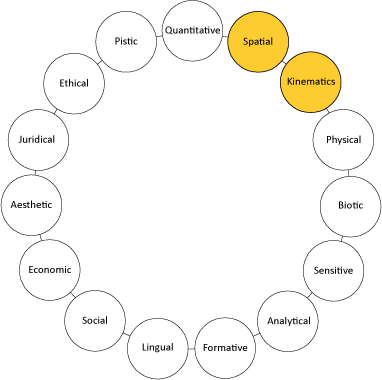 The fifteen aspects, as shown on the left, provide a distinct set of concepts by which the a building's setting, and operating environment, can be considered and defined. As an SI IDENTIFICATION TOOL: Building specific sustainability indicators (SI's) can be defined for each of the fifteen aspects through a process of online information exchange with the buildings operations user. The individual aspects are progressively enabled and illustrated on the dashboard within the user's account. This provides effective management of sustainability indicator development. As a REPORTING TOOL: The framework holistically illustrates the dimensions of influence on sustainable development performance, and the assessment portal provides a tangible prediction of the actual performance of those the aspects both individually and as a collective whole. This can be compiled as a report or presented as live dashboard information.